Nova Scotia’s Eastern Shore may seem a bit remote, but in reality, it’s just a couple of hours from Halifax, Antigonish or Cape Breton. And it’s worth the drive—the highway along the shore offers spectacular views as it meanders along past bays, coves, inlets, tidal marshes, pristine beaches and rugged coastline. Coastal islands dot the nearby waters, and all of it offers hikers, nature lovers, paddlers, history buffs and photographers much to enjoy. Arriving in Guysborough, NS—a town that was settled in 1629—feels something like stepping into the past; many of the lovely multi-coloured wooden houses date from the 1800s. The town’s famed Rare Bird Pub & Eatery rests in a bright red building that itself dates from 1866, when it was a general store. Its recently-restored woodwork and original tin plate ceilings, in addition to the onsite brewery and deck overlooking the marina, make it a great spot to unwind. You’ll find the Skipping Stone Café & Store right above the marina, in the historic Hart Building on the Guysborough waterfront. The café sells freshly roasted organic, fair trade coffee from Full Steam Coffee Co., which is located right across the street, as well as Harbour Belle Bakery’s artisan breads, desserts and gelato. The café’s courtyard overlooks the harbour; the store rents sea kayaks, canoes and bicycles. On the edge of town, the Osprey Shores Golf Resort offers brilliant greens and gorgeous water views. Comfortable accommoda-tions, a swimming pool and a bonfire area make it an ideal family holiday setting. DesBarres Manor Inn is an elegant and comfortable Victorian inn that was built as a home in 1837 for Justice W.F. DesBarres. The outdoor gazebo deck has a spectacular view of the valley and is a popular wedding venue. Upstairs, the bedrooms are spacious, luxurious and welcoming. An antique writing desk in the master bedroom offers a view of the back lawn and the valley below (with the modern convenience of a Wi-Fi connection) is a writer’s delight. Dinner at DesBarres is a memorable experience. Their four- and five-course meals have creative flair; each beautifully presented dish offers unique flavour combinations. Chef Joe MacLellan is inspired by local ingredients and trained in the French culinary traditions. My meal featured his light Poutine appetizer; Seared Scallops; Roasted Butternut Squash Soup with Truffles, Foie Gras and Walnuts; succulent Beef Tenderloin with Roasted Mushrooms; and was topped off with bite-sized Banana Bread Pudding with three kinds of homemade ice cream. For a short hike, the grassy Shoreline Trail starts at the end of Guysborough’s Main Street and winds along Chedabucto Bay. Trail signs describe the history dating back to the 1600s when the area was buzzing with shipbuilding and a large, vibrant port. 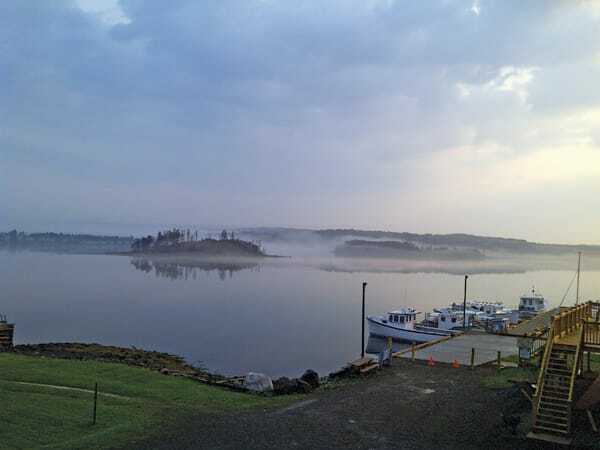 For a longer hike, the Trans Canada Trail runs through Guysborough. From Antigonish or Cape Breton, take exit 37 off Highway 104 at Monastery; travel south from Highway 4 onto Highway 16, through Boylston to Guysborough. From Halifax, travel east and follow Marine Drive. Watch for signs indicating the status of the Country Harbour Ferry connecting Port Bickerton with Isaac’s Harbour North across Country Harbour. If it is open, take Highway 211 just past Sherbrooke; if it is not operating, continue on Highway 7, turn right at Melrose Country Harbour Road and again onto Guysborough Country Harbour Road at Cross Roads Country Harbour; follow the signs to Guysborough. 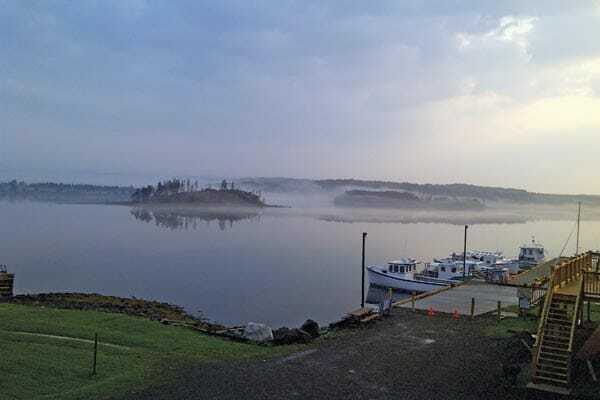 If you want to explore a little farther afield, take Highway 16 out of Guysborough to the tiny fishing town of Canso, which is perched on the extreme eastern point of Nova Scotia. Canso is famous for the Stan Rogers Folk Festival, held annually in July. The offshore Canso Islands National Historic Park is accessible by boat. South on Highway 316, Seawind Landing Country Inn is tucked away in beautiful Charlos Cove, with comfortable rooms overlooking the ocean. The 20-acre property has quiet walking trails through ferns and woodland, and along the ocean. Kayaks and canoes are available for exploring the cove. The innkeepers, David and Ann Marie de Jongh, offer friendly hospitality and tips on the nature and local activities in the area. Dinner menus feature local specialties, and the breakfast of blueberry-stuffed French toast is out of this world. With ocean views on three sides, this location is surrounded by the peace and beauty of nature. A short drive takes you to Tor Bay Provincial Park, where you can walk sandy beaches with views of the offshore islands and nesting sea birds. Boardwalks wind through marshlands rich with colourful mosses and ferns. Keep in mind that, because they are off the beaten path, some of the back roads in this region are not in pristine condition; caution is recommended if you’re driving an RV. But that’s in keeping with the flavour of the region, anyway. It’s best enjoyed if you slow down and enjoy the scenery.